Alberto Contador crashed yesterday during the elimination contest at the ACP Criterium in Boadilla de Monte, Madrid. Alberto fell on his left side after a puncture knocked him off balance while taking a corner of the circuit. CYCLING WEEKLY referenced a report by El Mundo this morning, saying that Contador "crashed badly in a criterium near Madrid on Sunday. With bruises all down his left side, the world's leading stage racer was taken to hospital for a full-scale check-up before being given the all-clear. Alejandro Valverde won the overall classification today in Pamplona, in spite of Contador's victories in two of the three divisions. Valverde prevailed thanks to his strong showing in the points category. Alberto will participate in the Criterium Comunidad Foral de Navarra today in Pamplona. LIVE COVERAGE begins at 11:30 GMT + 2. 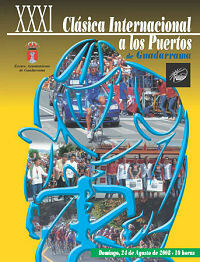 This year’s 19th edition celebrates the 75th anniversary of the Unión Ciclista Navarra. It also commemorates José Joaquín Pérez de Obanos, a man close to cycling who was killed last August in the plane crash at Barajas airport in Madrid. Contador had orginally declined the invitation to ride, citing exhaustion after his win in the Vuelta. He'll be competing against Haimar Zubeldia, who will become his teammate at Astana in 2009. Also riding in the pack of 29 will be Alejandro Valverde, Luís León Sanchez, and other prominent riders. The Criterium, which was not held in 2007 because of budget problems, will begin at 11:45 a.m. with the presentation on the Avenida de Bayona. Following will be sprint, points, and elimination contests. Spain didn't have the magic at the Worlds in Varese. In a crazy mixed-up race, the Italians stole the show. No fourth championship for Freire. Alberto was DNF, calling it quits for 2008, dehydrated and exhausted. Surprise! The rainbow jersey is now on the shoulders of Alessandro Ballan, and the great Bettini has announced his retirement. 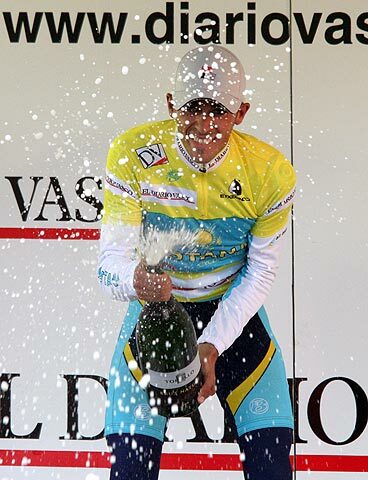 Contador’s Astana team snatched the first two places in the Clásica Internacional a los Puertos de Guadarrama today. American champion Levi Leipheimer finished first, followed by Contador himself, 41 seconds later. “It was a good test, since the race was insane from the beginning and demanded a good effort. I’m happy with the sensations I’ve had and I think I’m showing good form for the Vuelta a España,” Contador said after the race. Leipheimer and crackerjack gregario Chechu Rubiera broke away early with 15 others for a two-minute advantage. Alberto—comfortable on the route through his regular training grounds—bridged the gap on the climb of El León. After stretching his legs and stirring up some nervous tension in the group, he fell back with the main peloton until the slopes of the Cat. 1 Navacerrada. There he escaped and flew to the leaders’ group, where he launched another practice attack. Leipheimer went away for real, riding the last 10 km with no one in close pursuit. "Clásica a los Puertos: TODAY WAS A GOOD DAY. I wanted to confirm that my sensations are good, and that’s just what happened. "At the beginning there was an escape and I had to come from behind on the climb of El León—it really pissed me off. Then another group broke away, so we waited for the peloton so the team could narrow the gap before the Navacerrada; after some good teamwork I attacked and made contact with the four guys in the escape. The Clásica a los Puertos is a one day race in the Sierra de Madrid, mountains in the outlying region of Madrid that also make up part of the route for this year's Vuelta. The race was founded in 1978, and has had a host of illustrious winners: Delgado, Induráin, Escartín. Last year's winner was Hector Guerra. This year the Clásica is a 146 km circuit featuring three categorized climbs. Riders will confront El León (Cat. 2) and a grueling four climbs of the Alto de la Seranilla (Cat. 3). The kicker will be the first category Puerto de Navacerrada. 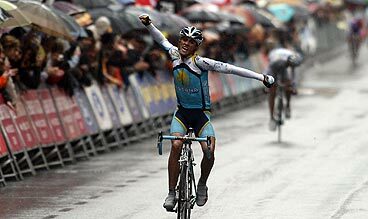 Contador fans know it: He won Stage 4 of the Vuelta a Castilla y León there in 2007 before going on to clinch the title. Sunday's face-off with the peak will be a taste of what might happen on September 20, when the Navacerrada will be the battle ground for Stage 20 of the Vuelta a España, an ITT that goes uphill all the way. ¡CADA CARRERA CON CONTADOR ES TAN BUENA COMO EL TOUR! See our Olympics section for more about Contador in Beijing. RESULT: After a race break of two months, Alberto Contador finished in 26th place, just 1' 48" behind winner, Alejandro Valverde. Complete reports, results, and photos on the way. Alberto spoke to the press after the stage about Friday's tough finish into Orio, and the rapidly-approaching hour of truth: Saturday's time trial. “There’s only a little difference between the top of the GC, and too many people in just a short time. Aside from the riders who are eight seconds down, even those that are fifteen have many chances to win the race. Anything can happen, and it’s as if the race is starting all over again. He scouted out the ascent of Aia before the race began, and although he admits that he is strongest, he doesn’t think that there are too many differences between the favorites. The best report today is Fabio's from the Daily Peloton. Today was a calmer and less-soggy stage, although it was wet enough to cause plenty of nervous tension. Forecast as a sprinters’ finish, there was a leisurely feel to it, with some time to look at the scenery while waiting for things to crackle in the last few kilometers. There was no word of crashes—a relief, because rain, bikes, speed, and curvy roads make a bad combination. Alberto was easy to spot in his citrus jersey. His team looked capable of getting any result they chose. The pack stayed together—is it warmer and dryer that way?—and when it was time, Astana nullified the break up the road. When the fireworks began, it wasn’t the sprinters that lit the fuse. About 10 km from Erandio, Luis León Sanchez—a large powerful rider—escaped. At one moment going the same speed as everybody else, and the next barrelling forward with the momentum of a charging rhinoceros, Sanchez must have scared the bejesus out of the true sprinters. Contador countered the move. He flew after his old friend and ex-teammate, not willing to lose any of his 29 second advantage over Sanchez. Alberto, we remember when he pulled a trick like this in Stage 6 of Paris-Nice. Nobody could catch him that day, and he won the stage. Drat the man! But it was some spectacle. Contador, Cadel Evans, and Peter Valtis caught Luis León, the peloton came back together. 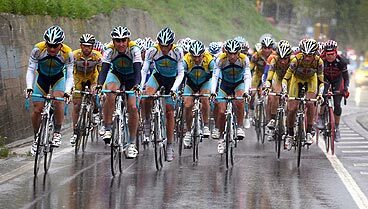 Then, a rainy-stage XYZ: a sprint, a crash, and a tight finish won by Kim Kirchen over Paolo Bettini. All the aforementioned protagonists stayed upright in the crash. “On crazy days like this, when everybody wants to sprint, there’s a lot of stress. Tomorrow will be a complicated day, too, because you see that people are really motivated. It will be difficult to control, but I hope to be ahead and to do well." He also thanked the fans for the booster signs that he saw along the route calling for his presence at the Tour de France, but he emphasized that since his team, Astana, has been excluded from the race, he can only focus on goals like the Vuelta al País Vasco, the Dauphiné Libéré, the Olympics, and the Vuelta a España. The sound of incessant rain hissed on the pavement as the peloton steamed through the Basque hills. 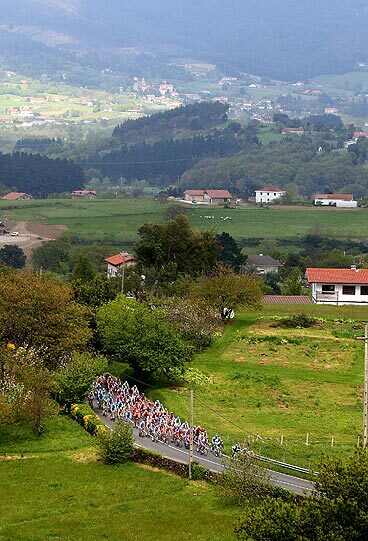 “The rain in Spain falls mainly in Basque Country,” said cycling.tv’s Brian Smith. It's a memorable quip because it’s always true in this April race. The TV showed images today of an angular landscape greener than the Land of Oz. Seen through a lens mottled with raindrops, it was a bottleglass world. Lovely. Quenching. For 188 cyclists, however, it was miserable. Colds and allergies are rife among the riders. The Astana team was boss today, and powered away with mudsplattered faces, hunkered over their bikes. Chechu Rubiera, whose authority in his farewell year is palpable, wiped his nose as he ground away. Alberto Contador wore a black rain jacket. This concealed his bib number (81) and much of his Astana blue. His own style was still clear: straight back, high shoulders, fast cadence, suplesse. The team kept him under cover in a USPS/Discovery-style formation. Wheels turned, the race simmered. The rain continued. The stage profiles for País Vasco tend to look like the remains of a shattered window—dangerously jagged. Today’s was so sharp you could’ve cut yourself, seven categorized climbs and all the unmentionables in between. 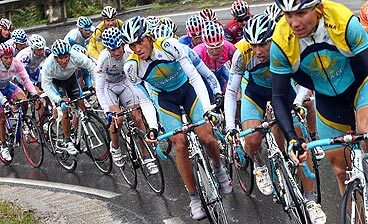 Astana bulldozed through the hills, pulling teams with huge grand tour stars: Evans, Cunego, Rebellin, Bettini, Sastre, the Schleck brothers. As the slope of the Alto de Deskarga approached, the pace increased. Contador’s jacket disappeared. Benjamin Noval hauled his mates through the sizzle and pop of the wet, face streaming, hair streaming. Dropping back, he was replaced by the slight and blond Kazakh Iglinskiy. They were as different as two riders could be. Tempo like a rolling boil, and Contador was off! The camera shook as the moto struggled to catch the action. 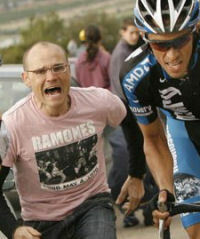 The picture vibrated, Contador overtook the moto, swept away to the right side, dancing easily on the pedals. The cameraman pursued him, but he receded into the distance, out of the saddle, chugging the pedals fast. Reminder: No, this is not Lance Armstrong. Alberto outstripped Ezequiel Mosquera of Karpin Galicia after a brief attempt at a collaboration that was not worth the trouble. The attack was perfectly timed. Damiano Cunego was the stalwart soul who tried to bridge. He failed. Flying through the final meters, Alberto pumped his fist hard several times, an unusually defiant gesture for him. After two salutes, fist-over-heart, he shot into the air with his usual pantomine handgun. I like to think it was a squirt gun today, aimed into the eyes of the Naysayers. Stage win. Basque hat. Yellow jersey. 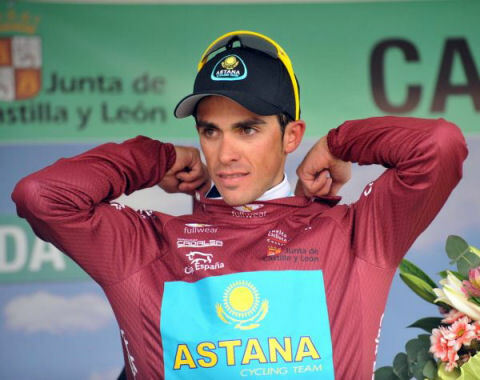 Contador: "Astana has given an exhibition"
The winner of Stage 4 of the Vuelta a Castilla y León and leader of the general classification, Alberto Contador, is full of praise for the work of his team, Astana. According to him, the team gave a commanding performance in the fourth stage, ending on the summit of the Collada de Salcedillo in Palencia. “The team has been hard at work all the time. There was a little while when we were confused and the escape got 3:40 ahead, but three riders—Chechu Rubiera, Serghio Paulinho, and Benjamin Noval—made a true exhibition of controlling the escape, and at the foot of the mountain Dani Navarro, Chris Horner, and Leipheimer were quite comfortable,” he said. Contador also admitted that during the last few meters, when he was just about to cross the finish line alone, he had “ considerable pain in the legs." "For that reason I wasn’t able to get more time on Soler, but the truth is, there have been races where I’ve been much closer to the limit,” he explained. “The team is working in the Vuelta a Castilla y León as if it were the Vuelta a España. They've been doing it since the start, and deserve to get something in return now, like the victory in this stage,” he commented. Contador said that he’s interested in a calmer stage tomorrow, from El Guardo (Palencia) to Riaño (León). Once again, when the cameras joined the race, it was master puppeteer Chechu Rubiera choreographing the stage. Astana was front and center all day, as they pulled the strings and made the peloton dance to their tune. Their backdrop was the glowering sky of Castile. Or was it Eastern Colorado? Either way, Astana seems headed for the high mountain. Result: Pack finish; winner - Ventoso; race leader - Alberto Contador. Alberto and Chechu both have a special friend in Benjamin Noval. Chechu and Benjamin live near each other in Asturias, and train together regularly. Benjamin was Alberto's chief domestique and roommate in the Tour last year. This season they have the same race calendar. Here are their results for Stage 3. Magnificent views of the Roman aqueduct at Segovia, the still-frozen countryside, and the fortress at Avila formed a biblical setting for today's stage. The multitudes squirmed, but couldn't shake the stony hand of authority. Although struggle was gripping, you knew who would remain in control in the end. It might sound like a description of a Cecil B. DeMille movie, but in fact it was a bike race. Astana dominated. Nobody succeeded in overthrowing them. Alberto Contador is The One. Alberto rode strong today, but Murcian Alejandro Valverde was on fire to win his home race, and gave a performance his friends and neighbors could be proud of. This week, Valverde has been referred to repeatedly in the Spanish press as "a prophet in his own land." The phrase only makes sense if shortened from the full version A prophet is without honor in his own land. The Caisse D'Epargne rider was not despised in Murcia today. Alberto came up 6 seconds short, and landed at third in the general classification. Cathy Mehl offered a few words from Alberto in her report at the Astana team website. "I was feeling good about the TT but the last k's were a little too hard," commented the 2007 Tour de France champion post race. "I think after the bad news about Paris-Nice and the Tour I left everything a bit and didn't properly prepare, but I did what I could." DS Alain Gallopin was upset at the race organization for giving him the incorrect information that Valverde was 50 seconds behind Contador at the intermediate check point, information a rider uses to gauge his effort on the ride. "So Alberto had wrong information during the time trial," explained Gallopin. Another factor to contend with was an ambulance speeding by on course while Contador was riding. The emergency vehicle needed to reach an ailing rider, requiring Contador to move over to let it pass. Adjustments are difficult on an uphill course, and could easily have cost Alberto the few seconds' margin between himself and victory. Yellow jersey Aitor Perez proved the point in a way that was painful to watch. He crashed on the course, then strained to regain his tempo on the hill. He never got back on the beat, and his days in yellow were finished. In summary, you might say that there were no real surprises. The favorites--Valverde and Contador--dominated, as predicted. Alberto has another excellent time trial result for his palmares. And the only three competitors left standing in the Vuelta a Murcia are Valverde, Contador, and second-placed Garzelli. But for Alberto, it wasn't a lucky day. Bad luck can affect the big picture or the details. It can come in the form of a thunderclap from the ASO, or the momentary distraction of a passing ambulance. C'est la vie. Perhaps it was brought into perspective by the news of the day. The podium ceremony paused while the hundreds gathered observed a moment of silence in memory of Isaac Carrasco, a noted Spanish figure who was assassinated today by ETA. Argentinean Juan José Haedo (CSC) prevailed as the peloton arrived together in Stage 3 of the Vuelta a Murcia. After 146 kilometers of racing, it was Haedo in front of Koldo Fernandez (Euskaltel-Euskadi) and Australian Graeme Brown (Rabobank). Haedo’s time was awarded to the main group, which contained Aitor Perez Arrieta (Extremadura), who tops the general classification. Stage 3 was very calm. The escape of the day was formed by Harrero, Teruel, Harrada, the Portuguese Salgueriero, Russian Klimov, and others who didn’t succeed. At 35 kilometers another group got away, and got a three minute advantage, but they were shot down in flight by the sprinters’ teams. Next comes the 23-kilometer cronoescalada (climbing time trial) on Friday, which will decide the competition. Alberto Contador appears to be the great favorite to win the Vuelta a Murcia. Although it’s March and he has hardly raced yet, Contador is mentioned in all the predictions. 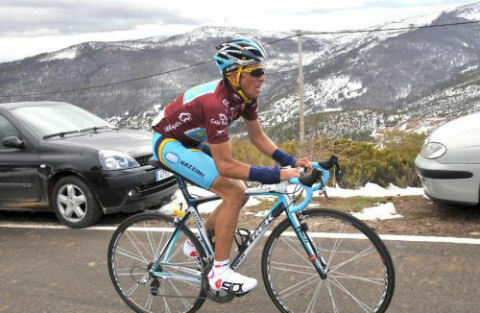 Neither Perez Arrieta nor second-placed José Luis Rubiera are considered particular favorites in the demanding Stage 4. Alejandro Valverde is not a specialist in time trials, and certainly not in cronoescalada. For that reason his performance is an unknown quantity, like that of Manuel Vázquez. Stefano Garzelli could make a difference, or possibly Ricardo Serrano. Javier Etxarri is a good climber, but hasn’t logged enough miles so far this season. In the Vuelta a Murcia there are many riders who still lack form. Today was the queen stage of the race in Murcia, featuring four categorized climbs. A true test for the climbers, it was just the kind of stage where Alberto Contador excels. The exaggerated ups and downs of the Espuña and the Col de Bermejo would be risky even in summer. On this day of fickle March weather the dangers to the peloton were too great, in the minds of many, to carry on with the race. Mother Nature was very uncooperative, even malicious, and unleashed hurricane-force winds, drizzle, sleet, and snow. The stage paused after about 40 km, while riders discussed the safety of continuing. A good number were in favor of suspending the stage, but the vote was to brave the conditions and race. Away they road into the teeth of the icy wind. Whatever heat Mother Nature refused to supply today was generated by thrilling action on the bikes. Alberto led in a small group of celebrity riders, bulletproof mountaineers like Garzelli and Valverde. His efforts were backed up by teammates Toni Colom and Chechu Rubiera. The three made up an audacious subdivision of Astana, powerful and aggressive, nimble and fleet. When the front group made it to the finish, it was Rubiera who surged for the victory. He defeated Aitor Perez in a clean close sprint. No argy-bargy, no bad manners. A simple and elegant slice across the finish line. Perfect balance, Mozartian. Nice. Alberto and Colom were nearby, and finished in 7th and 9th, at .06. Alberto's in 4th on the GC now, at .06. They say the time trial in Stage 4 will make the difference in the race. Guess who's the favorite? Alberto looked relaxed and happy in live coverage of today's stage. He sprinted into 12th place at Lorca, staying away from the danger of crashes farther back in the peloton. His strong finish indicated that he's feeling strong and ready for the big challenge tomorrow, a strenuous day for the climbers. 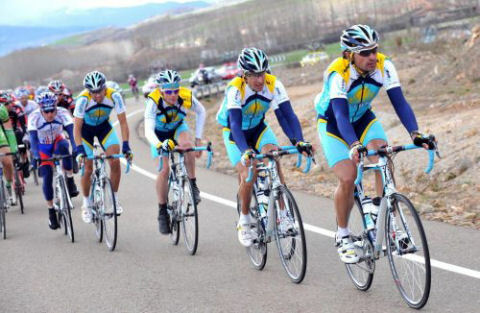 Todociclismo reports Rabobank rider Graeme Brown won the first stage of the Vuelta a Murcia 2008, on a course connecting the villages of San Pedro de Pinatar and Lorca. The Australian took five hours and eleven seconds to cross the 197.3 km course, the same amount of time as Spaniards Koldo Fernadez (Euskaltel Euskadi) and Aitor Perez (Extremadura), and the same time given to most of the peloton. The Tour of Murcia is usually a match-up of a galaxy of stellar riders. The biggest names at the first stage today were both illustrious winners of the Tour de France, Oscar Pereiro (2006) and Alberto Contador (2007). 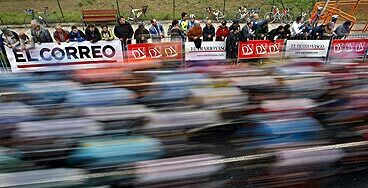 Racing with them were the most promising Spanish cyclists, like Murcian Alejandro Valverde, the last winner of his home race, and celebrated riders Samuel Sanchez and Carlos Sastre. Notable riders from other countries were also present, like Russian Denis Menchov and Italian Stefano Garzelli, riders with long lists of achievements including, respectively, victories in the Vuelta a España and the Giro d’Italia. The main players of the day were Lopez Gil (Andalusia Cajasur) of Spain, and Alexander Serov (Tinkoff) of Russia, who were off and running from the start line, and got more than fifteen minutes advantage, but were neutralized at about 3,000 meters from the goal line. These two riders—recognized in the professional peloton in spite of their unremarkable palmarés—tend to specialize in galloping ahead, as they did in Stage 1, and more particularly in working for their teams throughout many seasons in elite cycling, in Gil’s case since 2003, and in the Russian Serov’s, since 2001. They took flight as usual. In spite of the gap which they opened, the two heroes of the day failed in the end, in spite of their experience and savvy. The sprinters’ teams used both their combined forces and the stiff wind to their advantage, punishing the riders who had broken away and ending their heroic escapade only 3 km from the goal line. After the catch, another phase began, and the Australian Brown made it clear that he’s starting to achieve the goals he outlined in the first part of his season, since he won commandingly, as he did a few days ago in the Vuelta a Mallorca. The stage played out as expected, or in other words, the adventurers took advantage of many kilometers in the limelight, and the sprinters finished it off, livening up the stage by allowing the escape to reach 16 minutes before reeling it in. The big names—Alberto Contador, Pereiro, Valverde, Menchov, and Garzelli, among others—had their moments here and there, but in the final part the reigning Tour winner, Contador of Spain, proved himself and put in a sprint for 12th place. Contador made it clear that he intends to fight for the final podium after the change of plans he’s been forced to make in his training following Astana’s exclusion from races organized by the Tour and the Giro. Tomorrow, Stage 2 runs between Calasparra and Totana, covering 152.5 km. This is considered the queen stage of the race, and includes the categorized ascents of Ricote (3), Pliego (3), Espuña (1), and Col Bermejo (1). No romantic views of the Mediterranean coast today, as the final kilometers looped the city. It was a grey industrial metropolis, with one strip of fancy embroidery: the peloton. Alberto has another top ten finish for his palmares. He finished the stage in 62nd place, with the pack behind stage winner Alessandro Petacchi. His result for the general classification: 6th, at 0.33. An escape, a capture, a sprint, and a noisy man named Javi on a moto: that was Stage 4 in a nutshell. Commentator Javi Domenich calls the action in Valencia from his seat on a motorcycle. When the wheels spin faster, Javi's patter tempo and pitch level skyrocket. Never a dull moment. The final sprint in Nàquera was not a carnivorously grinding Mix Master. But a sprint's a sprint, a dodgy place to be, even for those who specialize in bump and grind cycling. What was Alberto Contador doing there?! Answer: The stage ended in an uphill sprint, and Alberto likes to race. It was apparent near the end of the stage that Alberto wasn't going to shut himself out of an opportunity. Although he didn't risk injury in a play for the stage win, he protected his spot in 6th place, and was on hand to improve his position if things went right. Good for the fans: we got to see him dance, but he stayed safe. The sky was foggy at the race today, and for a while, so were the results. 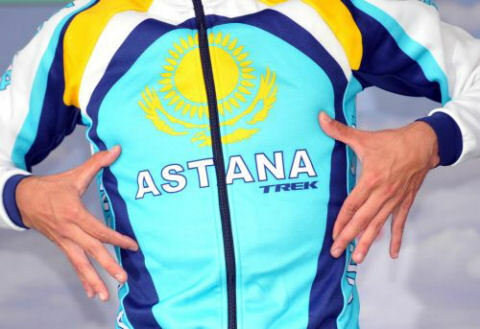 But the Astana boys were clearly in form. Confusion about the route led to a SNAFU not far from the end. When the race reached a poorly-marked roundabout, some went right, and some went wrong. Part of the peloton rode an unplanned route to the finish. As a result, the pursuing group failed in its sure bid to overtake the leaders. After officials had reviewed the matter, the unlucky pursuers--including Alberto--were given a time 16 seconds behind stage winner Manuel Vazquez and new yellow jersey Ruben Plaza. The stage was brisk; the mood, aggressive. Alberto joined in the attacks, as did teammates Toni Colom, Dani Navarro, and Maxim Iglinsky. But at the end of the day, what could they do but shrug it off? Alberto showed his philosophical side with a shrug and a laugh captured by the camera, played and replayed by TVVi in slow motion. You can read the story in detail in the reports, but you can't change the numbers: Alberto is in 6th overall, at 0.29. A quiet day. Alberto arrived at the finish in 21st, same time as winner Erik Zabel. He's now 5th in the general classification, 0:09 behind leader Iván Gutiérrez (Caisse d'Epargne). Alberto was already on the attack when the cameras joined the race! This thrilling start to the first stage race of 2008 didn't result in a win. But it shook up everyone involved, both his opponents (too bad) and the fans (good for them). At the end of the day, when all the bonuses and trophies had been given, Alberto was in 6th place, :09 behind stage winner Gutierrez. A day off for Alberto. He'll return to the race for stages 4 and 5. Today Alberto rolled out for his first race of the season. This was his first step toward...another Tour victory? An Olympic gold medal? With so much time ahead in 2008, those are fresh questions, with intriguing possibilies. In this initial spin, he came 41st, finishing in the pack just 3 seconds off stage winner Graeme Brown of Rabobank. To read more about the race, go to the Astana team report HERE. This race takes place annually on the largest of the three Balearic Islands, off Spain's Mediterranean (east) coast. For most of the riders, it's the season's first chance to test their legs in competition. 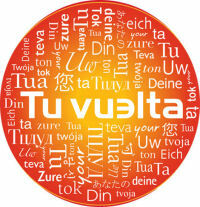 The Mallorca Challenge works in a special way that makes it an ideal season opener. Each stage is actually an individual one-day race, or challenge, for a regional trophy. 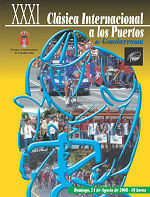 Taken as a whole, the five stages form a tour of the island with an overall title. Riders are not required to compete in every stage. Teams can pick and choose from large rosters according to the terrain of the day. So sprinters on some days, climbers on others, make for a flexible approach where everybody gets a chance to stretch, and everybody can target a prize. Only riders who participate every day are eligible for the overall prize. Alberto will ride in stages 2, 3, and 4. Our race reports will begin with stage 2, Monday, February 11. All text © 2007-2008 Rebecca Bell, contadorfans@hotmail.com. Web design by Nicky Orr and Modem Operandi. Masthead photo credits: (1) bbc.co.uk (2) Liz Kreutz, kreutzphotography.com.